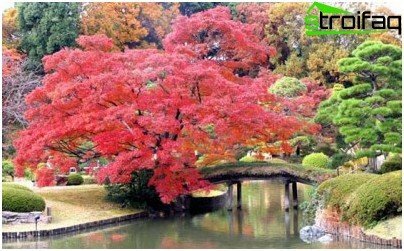 Garden in the Chinese style - it is something amazingbeautiful, peaceful and magical. Creating such a garden is based on the principles far from the traditional European world. Chinese culture can rightly be considered one of the most ancient. Long before our era the Chinese have built in their homeland huge temples that cased by lush gardens. 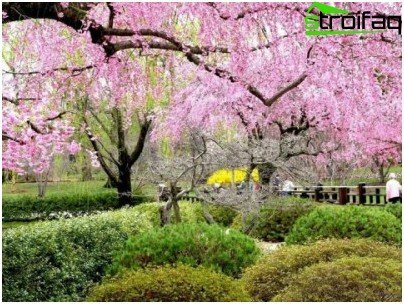 The main moments in the creation of a Chinese gardenare the provisions of the esoteric teachings of Feng Shui, which many consider the art, and some are considered to science. At all times in China is very serious about nature. It was believed that it is essential for all the joy and sorrow in the country. People wanted to live in harmony and peace with all the elements of the earth, so some religions such as Taoism and Confucianism, professed worship of all the forces of nature. Of these elements Taoists isolated fire, metal, water, earth and wood. Thanks to members of Taoist religion the concept of the existence of male and female "yin" and "yang" was developed. The well-known Feng Shui direction was createdChinese philosophers during an attempt to bring the laws of the universe. Influence of philosophy and religion reflected in the Chinese style, making it harmonious with nature and infinitely mysterious. 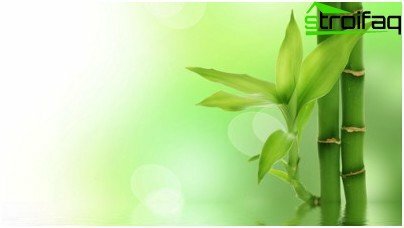 The word "feng shui" in Chinese, is denoted by the two characters. The first refers to the water, the second - the wind. According to Confucius, these two elements symbolize the movement of qi energy, which permeates all of space and fills the lives of people all around, even objects created by human hands. Therefore, the Chinese believe that all the problems associated with the career, health and financial condition are due to violation of the harmonious flow of qi energy. Not to be confused with the Japanese Chinese garden. Although they both Eastern, but quite different in principle of construction. When you create a Chinese garden is necessary to observe three basic rules. The first rule is that everything createdperson, especially his home, distorts the flow of Qi. Right angles and geometric shapes are typical of man-made objects, not coincide with natural flowing lines and chaotic. A Chinese garden is able to balance the energy flow violation. 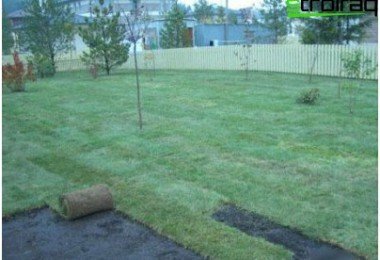 The second rule says that the house should bepart of a composition and be in the center of the garden. 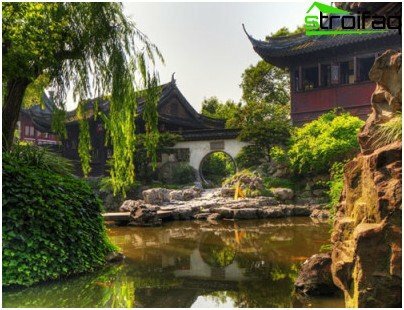 The main objective of Chinese style in landscape design - to create a finished composition, each element of which will guide the qi energy in the home side. This is the way to the house terrace you can see beautiful views of that of any other point not visible. In general, the house and garden should be a single entity. Then the owner will feel part of the universe, where everything is subordinated to its interests. The third rule is probably the most important. The Chinese garden is designed to not only aesthetically decorate the area. Its main task is, recovery of the owner. 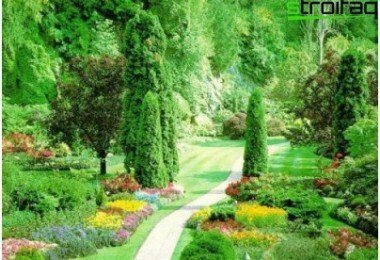 During a walk through the garden, where everywhere in the right direction circulates qi energy, the person feels not only a surge of strength and peace of mind, but also a positive charge, which helps to solve many problems. According to Feng Shui philosophy, ideas and thoughts that come to mind during these walks are the most correct and fruitful. It is important to learn to trust your inner voice and listen to it. Traditional Chinese art is characterized byhigh role his graphic component and specially created visual images that carry a particular meaning. In this Chinese garden symbolizes a world in miniature, being both a set of elements with a certain philosophy. 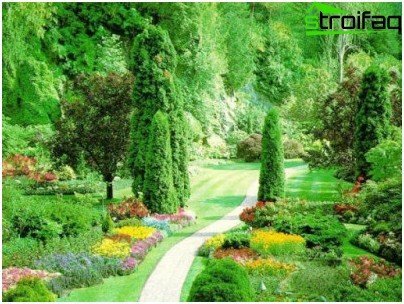 landscape design should create the impression of minimal intervention in human nature and look the most natural. The main idea of ​​the garden in the Chinese style iscreating a sense of harmony and infinity. From every corner of it should open a new landscape. Mandatory element of this area - it is water, which certainly should be represented in two ways - at rest and in motion. 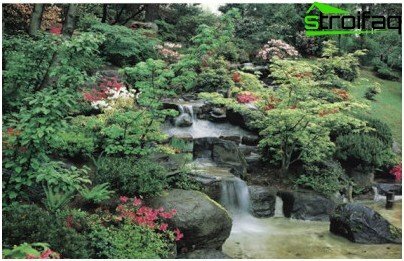 That is, in the garden you want to create a pond of stagnant water and the stream or waterfall, which will be accompanied by the murmur of a walk. Ponds should be with low beaches without facing, and their expanse is always shining colors of aquatic plants. Such waters provide the opportunity to contemplate the variability of the water surface and leisurely enjoy it. Through streams and rivers often throws a graceful bridge. 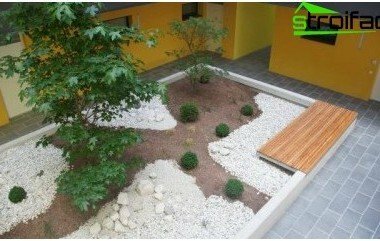 Stones are a set of energyearth and sky, so without them it is impossible to create a garden as a model for the world. Gemstones are selected very carefully, and are located strictly in certain places. They may be different, but the most valuable are the unusual colors and shapes of stones. The site can be decorated either one large picturesque stone or stacked tasteful slide of boulders. Plants on the hill should not be. 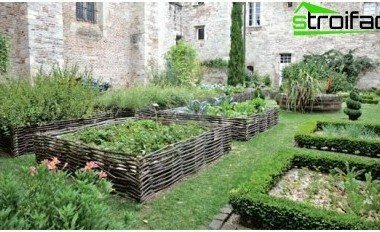 Garden Completeness emphasizes fencing,which must fit into the overall design of the site and to emulate the nuances of the relief. Decorating gate attached considerable importance, they are most often decorated with characters that represent happiness, harmony, peace. Handmade furniture, tea house or a terrace,made in the traditional style with rounded lines emphasize the presence of man in the garden. From anywhere in these structures must be visible landscape area, the owners were able to calmly contemplate the paintings of wildlife. 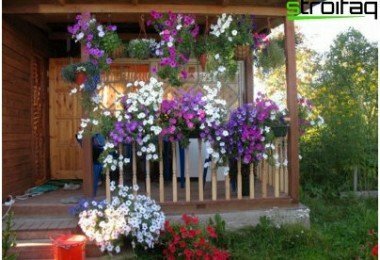 If you decide to make your cottage paradise in the eastern style, the first thing you do to help Chinese garden photos that will inspire and tell us how and what to arrange. Vegetation in the area can bediverse. 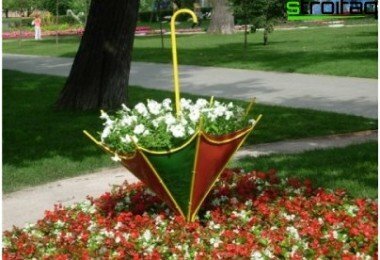 But every flower and shrub endowed with a special symbolism. 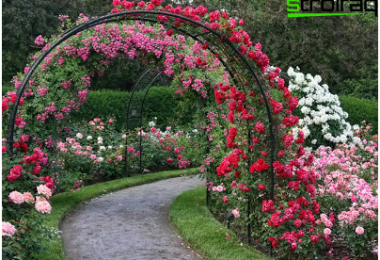 For example, roses symbolize love, peach - happiness, and pine - the nobility and strength of spirit. Bamboo is a symbol of the sacred void and without Chinese garden will be incomplete. Also here you can find jasmine and peonies, phlox, dahlias, chrysanthemums and tulips. 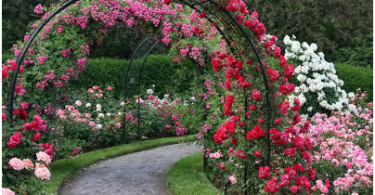 Particular attention is paid to the roses and their tea hybrids, which are considered native Chinese colors. Lanes Chinese edema always natural andThey have no boundaries. Paths can pass between the trees, go into the woods or to wriggle just above the water. 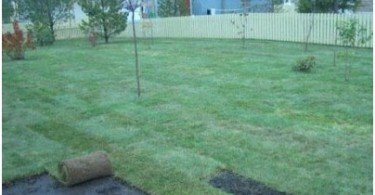 European empty lawn in a garden is no place, because all of the space to be filled. Each person is able to create a place where the atmosphere will reign unity with all life on earth. 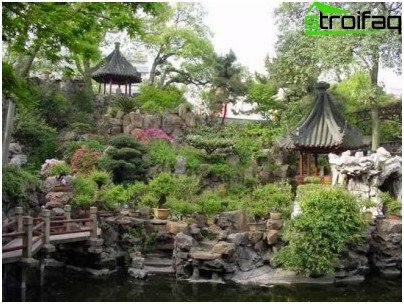 Chinese Garden can bring into your life the harmony and peace of mind.